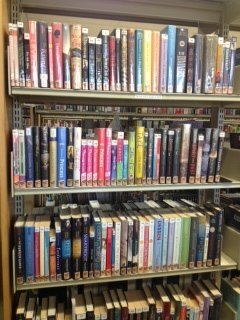 As the most recent addition to Windsor Public Library’s EMedia Collection, the Overdrive Teen Corner offers an excellent collection of books. These aren’t just books for teens, in fact the WPL Online Goodreads Book Club actually just wrapped up their May month by discussing Young Adult (YA) books. And it appears that the majority of adults read and enjoy YA literature as well! There is a little bit of everything in these books to offer every reader; horror, fantasy, romance, graphic novels, and the ever popular coming-of-age stories. For those looking for a fright, Miss Peregrine’s Home for Peculiar Children, which was a New York Times #1 best seller, and spent 52 weeks on the list, is a good choice. It is a quirky and strange novel, so much so that Tim Burton, director of the most eccentric and mysterious movies, is set to direct the film adaptation. Ransom Riggs has also written the second novel to that series, Hollow City, which can also be found in the ebook collection. Fantasy books are all the rage right now and you can read all of your favourites in ebook format. Divergent, Insurgent and Allegiant the dystopian series by Veronica Roth that sees the five factions of Abnegation, Amity, Candor, Dauntless and Erudite living amongst each other in post-apocalyptic Chicago, is a gripping trilogy that also made its big screen debut this year. Similarly, The Maze Runner is a perfect novel for fans of Divergent. One of the most popular contemporary writers of young adult fiction is without a doubt John Green. Green’s The Fault in Our Stars which debuted in 2011 became an instant success, and has for years remained #1 on bestseller lists. It is a heartfelt and insightful novel about Hazel Grace Lancaster the main character who attends a cancer patients’ support group where she meets Augustus Waters. From there a wonderful story unfolds around their bright and heart-rending relationship. Not to be missed are Green’s other wonderful novels: An Abundance of Katherines, Will Grayson, Will Grayson, Looking for Alaska, and Paper Towns. The quintessential YA coming of age story, The Book Thief, is about a young Liesel Meminger who is living in 1939 Nazi Germany. With a love of forbidden books, and a devotion to the hidden man in her basement, Liesel tries to create a life for herself through bombing raids and terror. This is a riveting book about love, family, and struggle. Other excellent choices in this genre are The Spectacular Now and Thirteen Reasons Why. Click here to see a list of the complete Teen Ebook section, and remember now is a great time to download as we partake in the Overdrive Challenge.